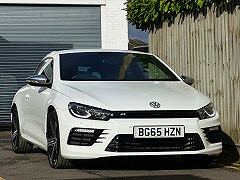 2015 Scirocco R with 280 PS 2.0 TSI turbocharged engine and 6 speed automatic gearbox. Extra cost colour of Pure white with black leather interior. Supplied 29/10/15 by VW Tamworth. one owner from new, logbook shows that owner as VW Financial Services Ltd due to vehicle being personally leased, we suspect it was driven by a lady however as there is a strong smell of perfume. 23000 miles with a full service history from VW (see images in slideshow below). Still on quite possibly its original Continental tyres date marked manufactured in 2015 with good tread left which suggests a very steady driver. HPI clear as with all our cars, print supplied on viewing. High specification with DSG gearbox, screen navigation system, leather upholstery, heated front seats, Bluetooth phone and music streaming, front and rear parking sensors, 19" 'Cadiz' alloy wheels. Standard spec includes paddle shifters, xenon headlamps with integral LED daytime running lights, LED rear lights, trip computer, media input socket, R branded brake callipers, adaptive chassis control, twin exhaust tailpipes, spacesaver spare wheel. 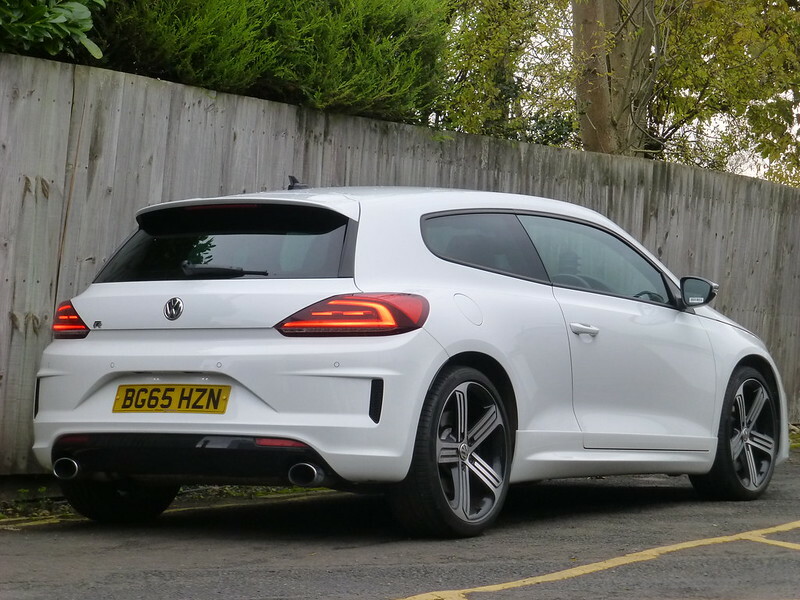 This Scirocco R has come direct from Volkswagen Group UK and was by far the best of the 5 we could choose from, the fact it was the only DSG one was a bonus. It is effectively box fresh with no refurbishment having been performed or required, even the wheels are perfect which confirms our suspicions it has had an easy life. Most for sale have kerbed wheels (some all 4), tyres which are in need of replacement with uneven wear and suspicious amounts of graining suggesting very hard use. As a result while there might be cheaper we are confident a perfectionist wont be disappointed as a refurbished car will never be as good as a carefully owned one like this.